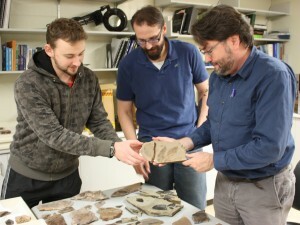 BRANDON, MB – A Brandon University (BU) researcher, working with students and an international team, has new evidence suggesting prehistoric earth was lusher than previously imagined – a rainforest from pole to pole. A major part of their findings, just published in the European geosciences journal Climate of the Past, is reshaping scientific discussions about our world’s climate then and now. Dr. Greenwood is one of the very few researchers in Canada using fossil plants to reconstruct climates during the Eocene Epoch, the warmest period on earth in the last 100 million years, when Canada was covered in forests and alligators lived in swamps at the North Pole. With graduate student Christopher West and BU Biology Honours student Cale Gushulak, Dr. Greenwood examined 56-52 million year old plant fossils from the McAbee Fossil Beds in British Columbia and from Ellesmere Island in the Arctic. Last fall, Dr. Greenwood and West, a Masters student in Geological Sciences at the University of Saskatchewan where Greenwood is an Adjunct Professor, were invited to Denver, Colorado, to present their research to scientists at the annual meeting of the Geological Society of America, the world’s largest geological conference. In February 2014, Gushulak presented his Honours thesis research findings at the Prairie Universities Biological Symposium at the University of Regina. In the related study to be published in Climate of the Past, Dr. Greenwood, working with a team of researchers from the US, UK, and the Netherlands, reconstructed climate from the very start of the Eocene Epoch for the North Sea area near Scotland, focusing on a short burst of global warming 56 million years ago called the Paleocene-Eocene Thermal Maximum, or ‘PETM’, which provides an analog for present-day, human-caused climate change. Dr. Greenwood’s research has been supported by grants from the Natural Sciences and Engineering Research Council of Canada (NSERC) and the Canada Foundation for Innovation (CFI), with additional funding from the Manitoba Research and Innovation Fund, and Olympus Canada. The publication can be viewed at http://www.clim-past.net/10/759/2014/cp-10-759-2014.pdf.